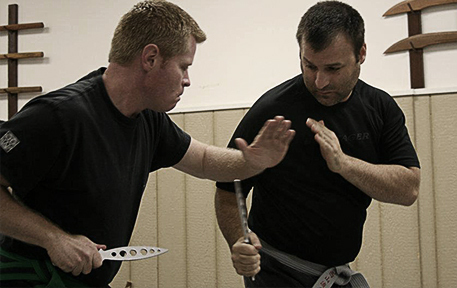 Arnis de Mano is a system that focuses on the use of — and defense against — impact and edged weapons, but it completely applicable as an empty-handed system as well. At Midwest Academy, we teach a Modern Arnis as developed by Remy Presas. Arnis is sometimes referred to as Escrima, Kali, or, more broadly, by the term Filipino Martial Arts (FMA). When people think of Arnis, they usually think of the use of long and short blades, single and double sticks, or some combination being used in weaving, blocking, and striking patterns or to disarm, control, lock, break, and throw an opponent. While this is accurate, it is only the surface of the system. As Remy Presas said, "Arnis makes many martial artists discover new things about their own style. They recognize the beauty of Arnis because it naturally blends the best movements from many arts."